This is the first book to cover in detail Europe's 50 greatest climbs, including detail on the actual route (with maps and profile), length, height, and compelling descriptions focussing on all the main points of interest along the route. Cycling has grown massively in popularity in recent years. The Tour de France draws huge audiences to the TV and internet coverage and all over the UK and Europe a growing number of people are taking to their bikes and rising to the challenge of Europe's most hallowed climbs. Mountain High is a book is for cyclists of all interests and abilities – from experienced club racers to enthusiastic amateurs who might just want to take on one great cycle challenge. 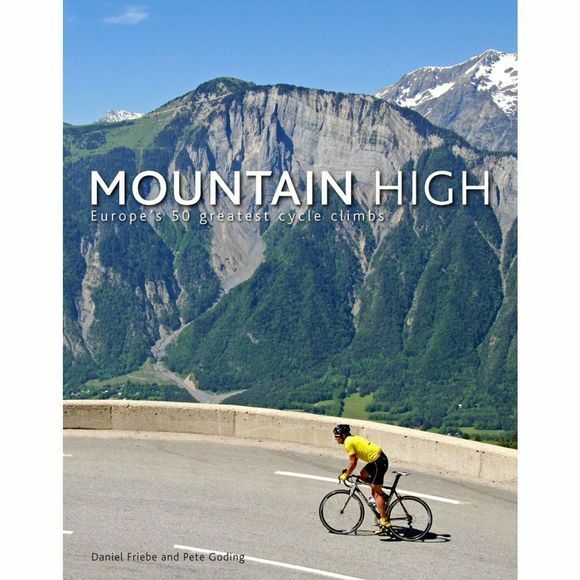 Packed with practical route information and advice on each climb, Daniel Friebe's beautifully written text explains why each mountain pass merits inclusion in the top 50 with superb descriptions of the majestic scenery, the heroic deeds of cycling's legendary riders or the sheer endeavour and exhilaration of reaching the summit. With over 250 specially commissioned photographs taken by specialist cycling photographer Pete Goding, this really is the ultimate guide to Europe's 50 best climbs. Featured rides include Tour de France icons Alpe d'Huez, Col du Galibier, Mont Ventoux, Col de l'Izoard and Col du Tourmalet; the Passo dello Stelvio, Passo Fedaia, Le Tre Cime di Lavaredo and other sacred summits from the Giro d'Italia; plus Spain's formidable Alto de l'Angliru, Austria's Grossglockner and forty more mountain legends.